Malaysia was accused Tuesday of waging an assault on civil rights as parliament passed a tough anti-terrorism law aimed at countering Islamic militancy. The passage of the Prevention of Terrorism Act came as the government announced that 17 militants — whom police say were arrested for plotting terror attacks in the country — had drawn their inspiration from the extremist Islamic State group. The new law allows authorities to detain terrorism suspects without charge. The political opposition as well as legal and rights groups had urged its withdrawal, warning of abuse by the long-ruling government. “It introduces long-term detention without trial, is open to abuse and is a grievous blow to democracy,” said opposition lawmaker N. Surendran. The government has previously said the law would not be used against anyone over their “political” views. Authorities have repeatedly warned of an imminent threat of terror attacks in the wake of the Islamic State’s (IS) rise in Syria, saying dozens of volunteers from traditionally moderate Muslim-majority Malaysia had volunteered for the IS jihad. Amid the heated debate over the legislation, police said that on Sunday they arrested 17 IS-inspired militants who were plotting to kidnap unspecified high-profile figures, rob banks and launch terror attacks. Releasing some details Tuesday, national police chief Khalid Abu Bakar said the conspirators planned to rob banks to raise money and to raid armed forces and police facilities for weapons. “Seventeen people between the ages of 14 to 49 were arrested while they were holding a secret meeting to plan terror attacks in the (Kuala Lumpur area),” Khalid said in a statement. 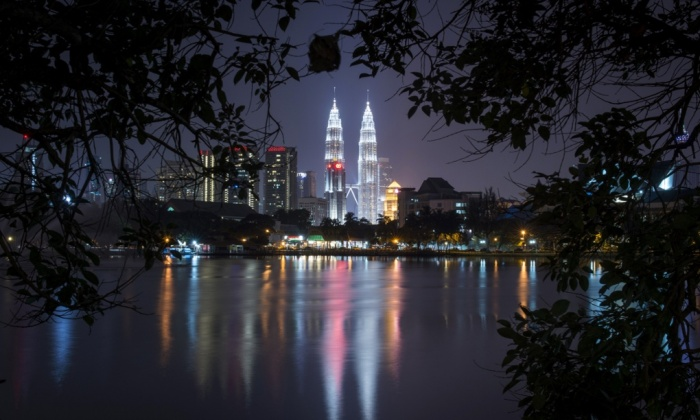 The attacks were to take place in the capital Kuala Lumpur and in nearby Putrajaya, seat of Malaysia’s federal government. Khalid said the arrests brought to 92 the number of people detained over the past year in Malaysia for suspected involvement in the IS jihad in Syria. The political opposition has complained that the government has shared no details of its dozens of claimed arrests or on the extent of the purported terror threat. Opponents of the coalition which has ruled since independence in 1957 but suffered setbacks in recent elections fear the anti-terror legislation is a ruse to bring back detention without trial. A previous repressive security law allowed such detentions, and was repeatedly used to lock up opposition politicians and other critics for long periods. That law was scrapped in 2012 amid public pressure for reform. “The passage of this (terrorism) law is a giant step backwards for human rights in Malaysia,” Human Rights Watch’s deputy Asia director Phil Robertson said in a statement. The United Malays National Organisation (UMNO), the dominant party in the ruling coalition, has faced a stern test in recent elections from an opposition accusing it of corruption and abuse of power. Prime Minister Najib Razak promised in 2011 to create “the greatest democracy” and launched tentative political liberalisation moves. But since a poor showing in 2013 elections, the government has done an about-face. Dozens of its critics including opposition politicians, academics, activists, and journalists, have been hit with sedition or other charges in what political analysts see as a campaign to harass and cow opponents. The anti-terrorism legislation was passed after midnight, following 15 hours of debate, according to media reports. The government did not immediately respond to a request for comment. Last August police said they foiled an IS-inspired plot to bomb pubs, nightclubs and a Malaysian brewery of Danish beer producer Carlsberg, arresting more than a dozen people. Since then a string of other suspected IS-related arrests have been announced, though few details have been given.